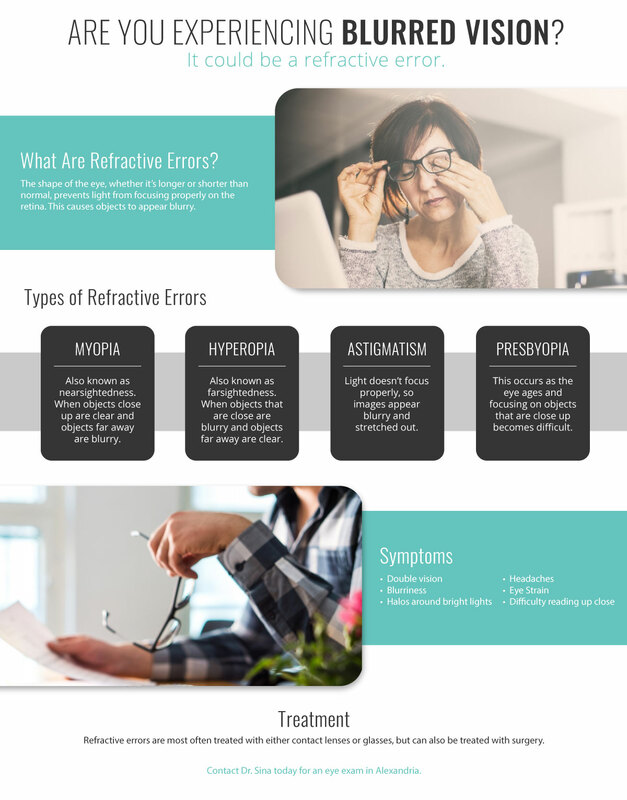 Refractive errors are actually fairly common, even though they often go by other names: myopia, hyperopia, astigmatism, and presbyopia. The one that stands out is probably astigmatism, right? We’ll go into detail about each further on in this post. Refractive errors are one of the most common eye conditions, along with cataracts, diabetic retinopathy, macular degeneration, and glaucoma. If you are experiencing any changes in your vision or eye pain, get in touch with your local Alexandria ophthalmologist right away. Dr. Sina Sabet and his team of optometrists will perform a regular eye exam to look for any abnormalities and will offer a treatment plan if there are any issues. These issues occur when light can’t focus completely on the retina. This happens because the shape of the eye prevents light from reaching the retina as it should. 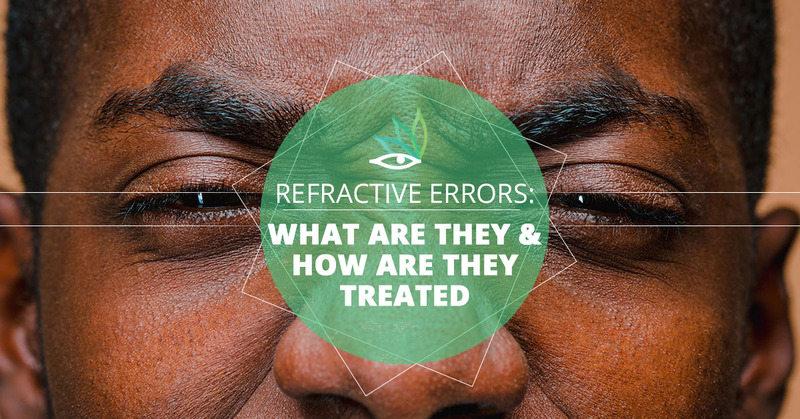 Refractive errors can be caused if your eye is longer or shorter than normal, if there was a change in the shape of your cornea, or as your eye’s lens ages. Myopia: Also known as nearsightedness, this is when objects close up are clear and objects far away are blurry. This occurs when light comes into focus in front of the retina rather than on the retina. Hyperopia: Also known as farsightedness, this is the opposite of myopia, and objects that are close are seen clearly and objects far away are blurry. When hyperopia is severe enough, objects may be blurry regardless of where they are. Astigmatism: This occurs when the light coming into the retina doesn’t focus properly, so images appear blurry and stretched out. With an astigmatism, the cornea is elongated, rather than more circular in shape. Presbyopia: This occurs as the eye ages and focusing on objects that are close up becomes difficult. 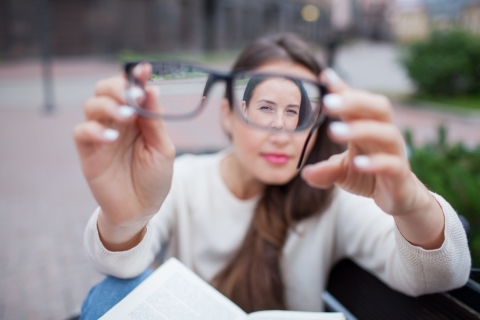 Presbyopia develops as the eye’s lens can no longer change its shape enough to allow objects to focus clearly. Everyone is at risk for far or nearsightedness, and presbyopia is more common in adults who are older than 35 years old. If one of your parents have refractive errors, there is a higher chance that you get one of the refractive errors. If you are experiencing any of these symptoms, schedule an appointment with an ophthalmologist as soon as possible. These are typically treated with either contact lenses, glasses, or possibly even eye surgery. The easiest way to treat refractive errors is with either glasses or contact lenses, but there are several types of surgery if your eye doctor recommends it or if you are interested in a permanent solution. If you notice any type of change in your vision, the best plan of action is to visit an ophthalmologist who can perform an eye exam. Dr. Sina and his team of eye doctors want everyone in Alexandria to get the best eye care possible. Visit us today and we’ll do a complete checkup to ensure there are no issues.